Last Sunday, February 3, leaks were successfully repaired in a WSSC water line adjacent to the Marriott Headquarters construction project, with only a temporary service outage affecting nearby properties. In the coming weeks, contractors will begin performing nighttime underground utility work along Woodmont Avenue. The development team has released the following site plan that outlines estimated dates for each phase of the work, including future phases along Wisconsin and Norfolk Avenues. This work will include upgrading the storm water, sanitary and water lines surrounding the site. Please note, this plan does not include anticipated Pepco work to be performed during this time. Noisy work will only be performed only during daytime hours. The work performed during nighttime hours will not include noisier activities. Nighttime construction is scheduled from mid-February to mid-November, Monday through Friday, from 6:00 p.m. to 5:00 a.m. Meanwhile, excavation and hauling activities will continue for the next several months. Blasting of the bedrock will likely commence in March, and concrete pouring operations will likely commence in May. 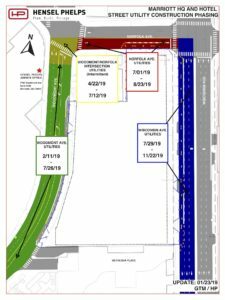 Throughout this time, the Montgomery County and State-approved traffic control plans will ensure minimal impact to traffic flow around the site. 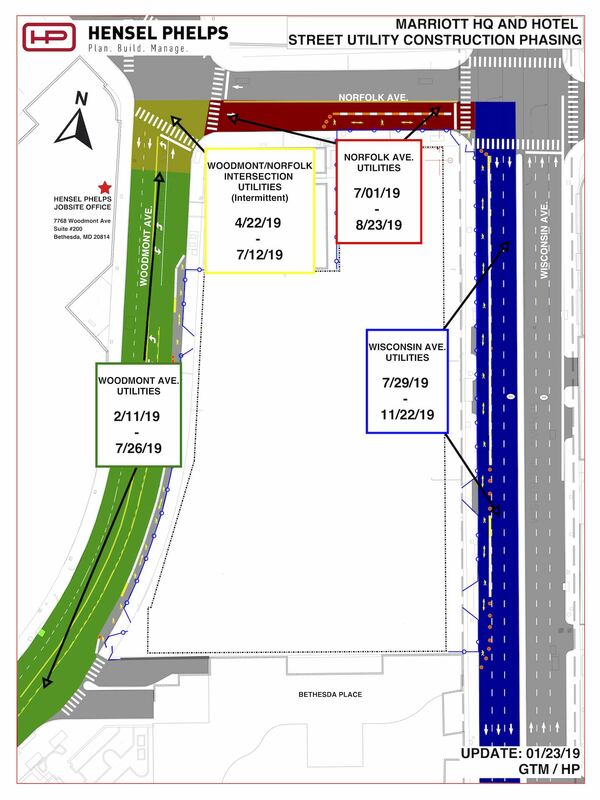 Lane and sidewalk closures remain in place along sections of Woodmont, Norfolk and Wisconsin Avenues (view map of all closures here), and additional temporary closures may be necessary during this time. Pedestrians will be detoured to the east sidewalk of Wisconsin Avenue during work hours and should take advantage of nearby crosswalks as needed. Please be vigilant and pay close attention to signage as detours may change occasionally. The developers and general contractor hold monthly construction updates for the general public. 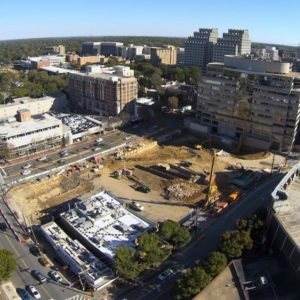 These updates are generally scheduled for the first Tuesday of each month and take place in downtown Bethesda at the Montgomery County Regional Service Center, on the second floor in rooms A and B, located at 4805 Edgemoor Lane, Bethesda, MD 20814. The next update will take place on Tuesday, March 5 at 6:00 p.m. Nearby residents, businesses, commuters, and other interested parties seeking reliable information about the progress of the Marriott International headquarters development site may call our Marriott HQ Development Update Hotline. In addition to the information already available from the MHQBethesda.comwebsite and development update e-blasts, now you can call and leave a voicemail for the development team. To leave us a message, call (240) 514-7831.